BRING YOUR HORSES!! 15 acre horse set up that any animal will love, fenced & cross fenced with Go-Bob welded gates, 6' fencing on all perimeter. Front entrance and large gate on south side of property for big transport trailers or deliveries, all pastures are gated from one to another so livestock can be changed for grazing purposes, large barn with 6 stalls & water conveniently located in middle of pastures. 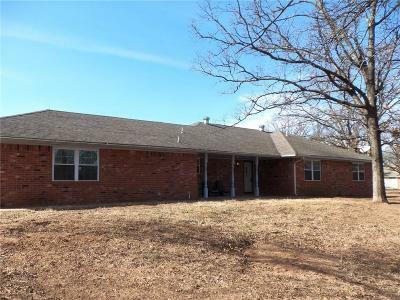 3 loafing sheds, large shade trees, some pecan, pond, hay shed, RV carport & storm cellar finishes out the exterior of this beautiful setting. House sets back off road for lots of privacy & up on the hill which makes a great view thru the trees to road. House has new carpet, lateral lines, windows, some plumbing fixtures, water softner & fireplace insert. Spacious living area with bookshelves built in around FP makes it great for entertaining but if that is not enough room you will enjoy the large Florida Rm with heating vents & ac. Chef will love the kit & din w/built in hutch.